We started out around 9:30 on Sunday morning from home. We drove as far as Erie, where we stopped for lunch at the Quaker Steak and Lube. From there, with a couple of quick stops in between, we made our way to Mason, Ohio - just north of Cincinnati. This is actually the same area/same exit we stayed in last year when Mike was in camp and Jill and I toured around the area going to baseball games and such. Before checking in at the hotel, we went to Abuelo's Mexican Food Restaurant. Had a pretty good dinner there before going to Bigg's Market to pick up some food and stuff for the week, then headed to the hotel. Our base of operation for the week was Hyatt Place. It looked identical to the one we stayed at in Atlanta in December of last year, with only a few cosmetic differences. On Monday, I got Jill set in her class and then Mike and I went out exploring a bit. 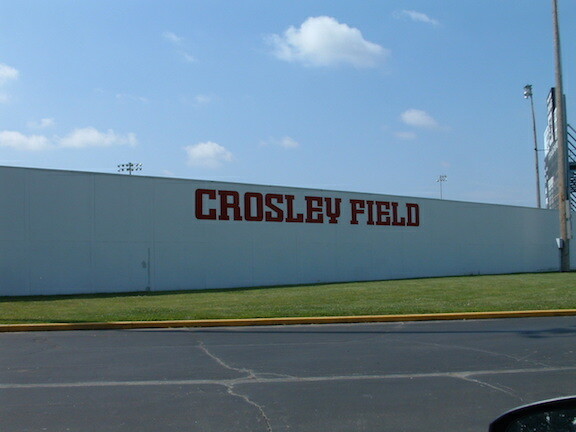 We went to Blue Ash, Ohio - a short drive from the hotel - to see the replica 'Crosley Field' that they had put up there. 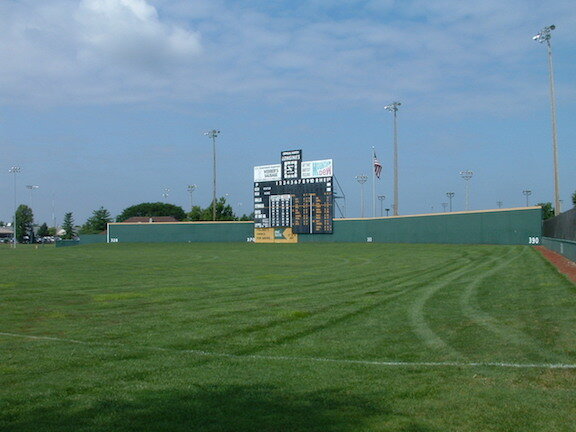 It included a replica scoreboard from the old park, as well as actual seats from the stadium. Then we went to Jungle Jim's and walked around there for a while. Afterwards, we settled on Skyline Chili for lunch before going back to the hotel and hanging out. Monday night after Jill was done with class we went out to dinner at the Polo Grille which was right up the street from the hotel. She had a seminar to teach later in the evening, and after that we went next door to Graeder's for some awesome ice cream. On Tuesday, Mike and I went to Kings Island. The weather forecast, when I checked it the day before, make it look like Tuesday would be the nicer of the two days (60% chance of rain vs 40%). As usual, though, the meteorologists were wrong! Mike and I dodged raindrops all day long, and when it started to thunder and lightning, as well as pour, around 2:30, we decided we had had enough! We went back to the hotel to dry off and warm up. Tuesday night we trekked into Cincinnati, well actually Kentucky, for the first time this trip. The Hofbrauhaus Newport was our destination. This was Jill and I's third time there, and Mike's second. Good food, good beer, good music - a definite thumbs up. We wandered around in the riverfront area in Newport before going back to the hotel (via the WalMart). On Wednesday, Mike and I did our third (of four) stadium tours for the Summer of 2010. 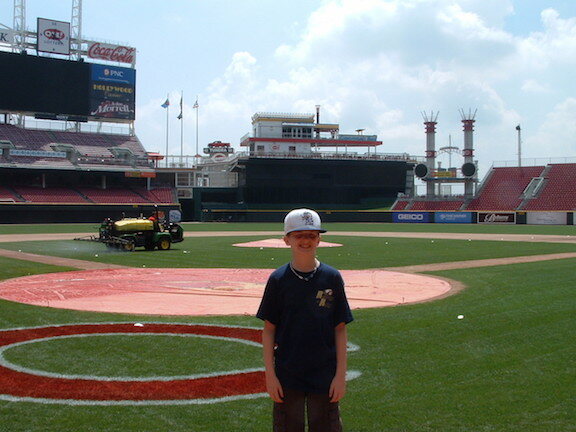 The Great American Ballpark, home of the Cincinnati Reds, was our destination. We toured through the park, and then took in the great museum and hall of fame the Reds had as well! Wandered Cincy a bit after that, finding the Cincinnati Gardens, before going to White Castle for some lunch and back to the hotel. Wednesday night, we drove up to Columbus for the MLS match between the Columbus Crew and the Kansas City Wizards. This was our second attempt at an MLS game, and it turned out a bit better than the first. Adequate stadium, albeit a little rustic, with a torn up parking lot (they were re-doing the main lots, so we parked in the grass) - a place we would probably return to if we happened to be in the area, but wouldn't go out of our way to get to otherwise. After the game, we searched out Thurman's for a late dinner. Man vs Food had been here previously, so we wanted to see what it was all about. Although the food was very good (pub fare - sandwiches and such), the hour wait for a table was a bit ridiculous, hampered mostly be an inadequate host. That in it of itself would probably keep us from going back again. Back to Cincy afterwards for some much needed sleep. So, now we are at Thursday. Mike and I had planned on going to Louisville to see the Louisville Slugger Museum, but after all of the driving the night before we decided we wanted to stay closer to the hotel and Cincinnati. Luckily, we had a backup plan! The Beach is a water park near Kings Island, and it was a discount day to boot! We arrived there around 11:00, and ended up staying until around 4:30, hitting most of the slides and rides. At night, after Jill was done with class, we tried going to The Melting Pot, but it was national ladies night out or something like that, so there was no room for us. Instead, we went to J. Alexanders and had a very good dinner. Afterwards we walked around the adjacent shopping area before calling it a night and heading back to the hotel. Friday arrived, and it was 'head home day'. Jill was teaching in the morning before finishing up, and I took advantage of a free morning to find a Laundromat and someplace to get the oil changed. Jill finished up, we packed the car, and off we went...next door to the Chik-fil-A for lunch! Woot! From there, it was north on 71 towards our 'halfway' point - Cleveland. Along the way, though, was one detour - Jeni's Splendid Ice Cream. It was definitely splendid too! Well worth the detour! We arrived in Cleveland around 5:45, found somewhere to park, and it was off to Progressive Field. I had been there previously, but this was Mike and Jill's first time there. Impressions? It's a ballpark - there's the field, here's the concessions, grab something and watch the game. It's interesting, because it seems like I remember when it was first built that they did not want Jacobs Field to be a 'copy' of Oriole Park in Baltimore, and that it's not. The light poles are the 'toothbrush' type, meant to imitate the industrial smoke stacks found throughout Cleveland; the facade on the outside fits well with the area. Overall the place had an 'older' feeling to it, even though (along with Oriole Park) it was one of the newer style stadiums in MLB, you could tell the era it was built in, meaning the stadiums built in the 2000's felt all that much newer and flashier than the first 'new' stadiums put up in the 1990's. We found a stand that sold chicken waffles and had a couple of those for dinner - they were great! We stayed until the end of the 8th, but with the Indians in the lead and fireworks after the game we decided to leave to miss the shenanigans. Back to the parking ramp and off to the hotel we went. Our last hotel night for this trip would be in the Holiday Inn Express in Mentor, Ohio (Room 219, $127.97 for the night). Interesting, it didn't look anything like an 'Express' hotel though, with a big conference center attached, and our hotel room was bigger than the Hyatt Place one we had just checked out of the previous morning. Considering this hotel was near the home of the Lake County Captains, I think it's on to keep in the rolodex since we'll be out that way again, and it was a very nice place to stay. We had breakfast on Saturday morning at the hotel before beginning the final leg of our trip home. On the way through, we stopped in Olean to have lunch at the Beef 'N' Barrel. After that, it was on the road back to Binghamton, where we arrived around 4:00 on Saturday afternoon. CLEVELAND -- The season did not begin anew for the Indians on Friday night. It just looked that way. It was a renewed, refocused Tribe team that took the field against the Tigers at Progressive Field, and the Indians thumped the American League Central contenders, 8-2, in front of 22,295. The largest walkup crowd of the season was on-hand, and fireworks lit up the sky in the aftermath. Now, if only the Indians could blow up the standings, too. Alas, the Indians will wake for Saturday's doubleheader and still be in last place and still be well below .500. But as the season hits the home stretch and the spoiler role becomes the part for which the Indians are cast, this win, ushered along by two-run homers from Andy Marte and Austin Kearns, certainly wasn't a bad way to get back to work. "We definitely can't erase the first half," starter Jake Westbrook said. "But it's the start of the second half, and we wanted to get off on a good note. It was a good effort tonight." It took Westbrook 31 pitches worth of effort to get through the first inning, all but ensuring his outing would be a short one. But it was an effective one, nonetheless, for the veteran Westbrook, who allowed just two runs on five hits with a walk and five strikeouts in 5 2/3 innings of work. He did the No. 1 thing one must do to calm the potent Tigers lineup -- limit the baserunners ahead of Magglio Ordonez, Miguel Cabrera and Brennan Boesch. "That's the key thing against those guys," manager Manny Acta said. "You can't have too much traffic on the bases, but they have a couple guys who can turn it around with one swing." Though Westbrook gave up a quick run in the first, the Indians backed him up with a pair in the second off Max Scherzer. Trevor Crowe tripled to score Matt LaPorta on a ball misplayed by Boesch in left, then scored on Jason Donald's fielder's choice to make it 2-1. "I got a lucky bounce," Crowe said, "and [Boesch] couldn't come up with it." In the fourth, the Tigers tied it when Ordonez doubled, moved to third on a Cabrera fly out and scored on a Boesch groundout. But the Tribe answered right back in the bottom of the inning with Marte's two-run blast to the left-field bleachers to make it 4-2. Marte was starting in place of Jhonny Peralta, who was out with the flu. Preserving the 4-2 lead was no easy feat in the sixth. Westbrook gave up a leadoff triple to Austin Jackson, which is not exactly an ideal situation for him. "I'm not a strikeout guy," Westbrook said. But Westbrook has other qualities that work in his favor, as Tigers manager Jim Leyland acknowledged. "He's a fierce competitor," Leyland said. "He's a veteran who knows what he's doing. You know you have to compete your fanny off if you're going to beat him." Westbrook got Johnny Damon to ground one back to the mound for the first out, and he managed to strike out Ordonez for the second. At that point, Acta opted to pull Westbrook, who had thrown 105 pitches. In came Joe Smith, and it got dicey when Smith walked Cabrera, the lone batter he faced, on five pitches. But Tony Sipp came on to get Boesch to strike out. That was arguably the key to the game, because the Indians broke it open for good in the bottom of the inning. A four-run outburst began with consecutive singles from Michael Brantley and Jayson Nix. Brantley moved to third on Brandon Inge's throwing error and scored on Carlos Santana's sac fly to shallow right. Travis Hafner then singled to score Nix, and Austin Kearns capped the big inning with a two-run shot to right off reliever Brad Thomas to make it 8-2. The Indians got a nice performance from the 'pen and never looked back. They knew they couldn't dig themselves out of the hole they created in the season's first three months, but nobody was complaining about the optimistic tone of this return to duty. "Even though we scuffled through some things in the first half," Kearns said, "we can build on some things and have a good second half." COLUMBUS, Ohio - Robert Warzycha has become known for tinkering with his lineup in order to get the best results as he navigates the Crew through a busy schedule. Wednesday's match against Kansas City was sandwiched between last Saturday's 0-0 draw at Houston and this Saturday's showdown at Crew Stadium against second-place New York. In the past, Warzycha might have rested several starters for a midweek match because he has so much faith in his full roster. However, he threw a curve against the Wizards and went with the same starting XI for the second straight match. The strategy didn't work because the Crew fell 1-0 to the Wizards (4-8-3) on an early Teal Bunbury goal and seven saves-several of them spectacular-by Jimmy Nielsen. "I thought that was the team lineup that would win the game," he said. He made several substitutions early in the second half, but he said he was still happy with how his starters came out after the break. "We started pretty well in the second half," he said. "We created some chances with the same group that started." Maybe so, but the Crew's scoreless streak is now at 225 minutes after being blanked for the second straight game-and the fourth time in the last seven. "Overall, we were happy with our performance, but not the result," goalkeeper William Hesmer said. "For the most part they didn't have many chances, but the chances they had were quality chances." The Crew also had several great chances, but they were consistently denied by Nielsen. Emilio Renteria entered in the 65th minute, Steven Lenhart followed a minute later and Emmanuel Ekpo was summoned with 15 minutes to go, and all three had scoring opportunities that will give Warzycha something to think about as he prepares Saturday's lineup. In the final moments the Crew flooded the box and bodies were flying, but the Wizard kept their composure. "We were pushing for it but unable to get it," Lenhart said. Prior to the match, the Crew had two wins and a tie since returning from the World Cup break, but they looked tired having played two U.S. Open Cup matches. That shouldn't have been the case, though, as Warzycha used a different lineup for one of the Open Cup games last week. Defender Chad Marshall said the team must regroup before Saturday's game against New York in Crew Stadium. The Crew (8-3-4) lead the Red Bulls by two points in the East. "It's frustrating, but we have to get back to training (Thursday) and sort things out," Marshall said. Admission to Kings Island was $33.99 a person for a one day adult ticket. From the 16th to the 17th we stayed at the Holiday Inn Express, 5785 Heisley Road, Mentor, Ohio; Our total charge for the night was $128.54.